In A Hometown Set, Kesha's Rainbow Tour Annihilates Authenticity : The Record Kesha has begun her tour in support of Rainbow, her first album in five years, bringing both a weighty triumphalism and uncomplicated fun to the Ryman Auditorium. Kesha Sebert, performing at Nashville's Ryman Auditorium Sept. 27, 2017 in support of her "comeback" album Rainbow. Midway through last night's set at the venerable Ryman Auditorium, Kesha Sebert stood at center stage in a Stetson and a bespangled Gunne Sax-style minidress, armed with a Winchester-style rifle affixed to what looked like an insecticide pump. Her fans, who'd been screaming nonstop since pop star had walked out, to the strains of her own Aretha Franklin tribute "Woman," knew what that canister should contain. 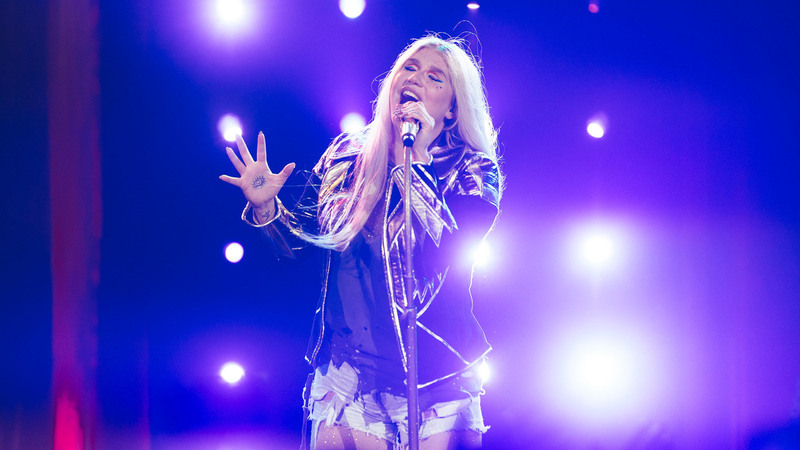 "Because this is the church of music, we're not going to f****ng destroy it with glitter," Kesha, who grew up in the Nashville suburb of Brentwood, announced. "Just know in my heart that I would love to cover you all in glitter right now." With that, she shot a ray of smoky light into the air. Glitter lives in Kesha's heart, and her new Rainbow Tour, which began the night previous in Birmingham, honors its garish magic while, more importantly, showing its dimensionality. The latest step in her successful quest to reclaim her space as pop's most bodacious rock star, her performance had her in great (and characteristically brassy) voice and rapturously connected to her audience, ready to both spill her guts and, in her own words, "get f***ing crazy!" The audience was with her every step of the way, weeping as she wept (while performing "Praying," her comeback gospel hymn of self-reclamation) and rushing the stage when she told them to (during the orgiastic "Take It Off"). When Kesha became a star, in 2010, the homophobic Defense of Marriage Act was being met with fierce opposition that foreshadowed its eventual defeat, and the military's "don't ask, don't tell" policy regarding sexual orientation was on the verge of repeal. The fourth female to serve on the Supreme Court, Elena Kagan, was confirmed. Today, in a drastically more conservative political moment, women and LGBTQ folk are focusing on maintaining the gains that, for the length of a breath, seemed inalienable. Kesha's survivor story resonates because it is also her generation's. "This is my personal life mission," she told the crowd, "to spread as much love and equality and f***ing rock 'n' roll as I can." Love and equality meet rock 'n' roll in the space where joy — generated by noise, outrageous pleasure, dancing, and voices raised together — overcomes judgment. In this decade, women pop stars have often created that space. Some, like Beyoncé and Lady Gaga, have made explicitly political moves; others, like Rihanna and Kesha herself, simply showed what personal freedom looks like now. Even in a year when women's dominance in pop has diminished somewhat (a swerve being corrected by Cardi B's emergence and the polarizing return of Taylor Swift), pop's women are today's rock stars, pushing limits and redefining moral codes. One way Kesha, in particular, is doing this is by annihilating the weariest myth still clinging to rock and its associated genres: authenticity. During her nearly two-hour set, Kesha seamlessly blended her "sincere" (and more sonically conventional) material and her "trashy" (and more musically hybrid) stuff. She entered to the strains of Janis Joplin and went right into "Woman," a song she recorded with soul preservationists the Dap-Kings. Moments later, she and her touring band were deep into "Boogie Feet," originally a collaboration with the Eagles of Death Metal and a direct descendant of Kesha's own comically excessive earlier hits. Throughout her set, she refused to sacrifice her playful spirit at the altar of gravitas. Kesha's performance satisfied and uplifted in all the expected ways, a triumphant return after the hardships of her long conflict with her former mentor Lukasz "Dr. Luke" Gottwald. (Songs like "Praying" and "Bastards" serve double-duty as unveiled rebukes against the allegedly abusive producer.) The show, like its namesake album, enacted a heroine's journey, with plenty of cathartically unhinged party breaks. Uplifting ballads alternated with bacchanalia like "Boogie Feet," reassuring the crowd that Kesha's long struggle for artistic and personal autonomy hasn't done in her sense of primal fun. An emotional peak came when Kesha's mother, Pebe, joined her to sing "Godzilla," a song they'd written together (Pebe has her own decades-strong resume as a songwriter). Directly after the teary moment, Kesha introduced her lascivious "Your Love Is My Drug" with a lighthearted "Sorry, Mom." This gesture was prototypical: Kesha's refusal to denounce the abandon of her previous work is one reason Rainbow transcends the clichés that defeat many pop comebacks. The piety that often augments sobriety doesn't interest her. Instead, she's exploring how to be both clear-eyed and libertine. That's a question Kesha's main fan base also finds itself facing these days. The audience — predominantly women and gay men — who came to see her made this night into a Pride celebration. They displayed brightly dyed beards and butterfly makeup and waved rainbow flags in time to "Hymn": "Don't need no forgiveness," they sang, "'cos if there's a heaven, we don't care if we get in." Expressing reverence for the Ryman, Kesha talked of listening to Bob Dylan to get her in the mood to play that hallowed stage; yet she also urged the crowd to leave their seats, a rare occurrence in a venue designed for sitting and listening. She changed costumes three times and turned "Timber," her Pitbull-aided dance-floor feeding frenzy of 2014, into a country song. During her slower, more redemptive songs, she occasionally shed quiet tears as she nailed the notes. But she came off as equally sincere and engaged while leading her two male dancers/background singers through rounds of bumping and grinding. The Telecaster and and hollow-body Gretch she played (not just for effect, either) only strengthened her pop poses. Unlike the only-just-former teen idol Harry Styles, who'd solemnly (and somewhat diffidently) strummed for nearly half his Monday Ryman set before accessing his inner Mick Jagger with some careful wiggling, Kesha knows what that old Stone always knew – that rock 'n' roll is absurd, and only feeds the serious work of liberation by shattering our sense of order via that absurdity. Turning America's church of music into an open field where wild emotion could run free, Kesha proved to be the only rock star we need today.